Brooklyn is laden with industrial areas, where people sometimes dump garbage, vandalize and leave waste. Trees have a difficult time maturing in this type of environment. Mature trees are essential to absorbing carbon dioxide, producing oxygen and stabilizing soil. Unfortunately, funding for community service to preserve the trees has been reduced. 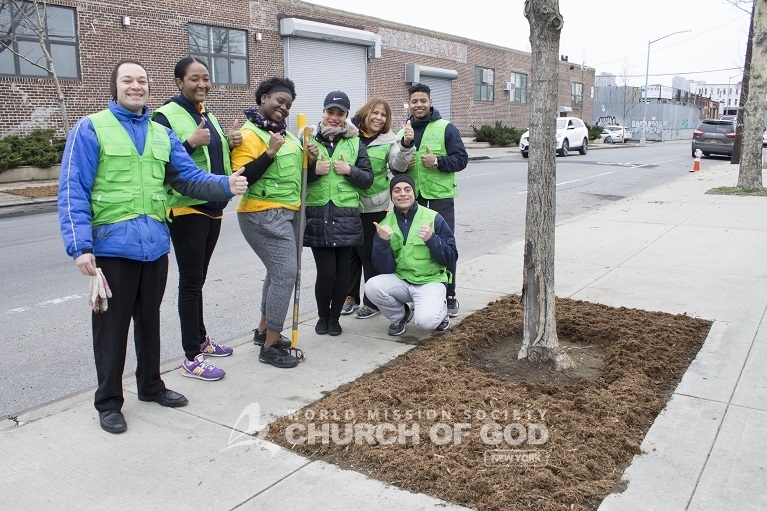 The members of the World Mission Society Church of God were ready early Sunday morning, March 30, 2017, and took the initiative to arrange a tree stewardship volunteer activity in preparation of the rebirth of spring. With rakes, shovels, cedar mulch and smiles, everyone set out to care for a tree. 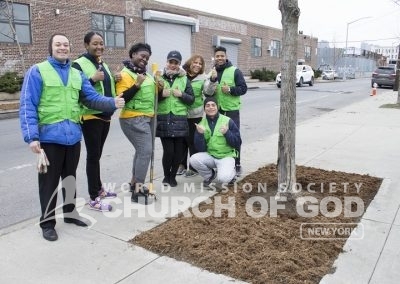 The Wall Street branch of the Church of God joined with Trees New York, a non-profit organization that plants and cares for street trees throughout New York City. About 30 volunteers met with Executive Director Nelson Villarrubia and Operation Manager and Educator Ashleigh Pettus. 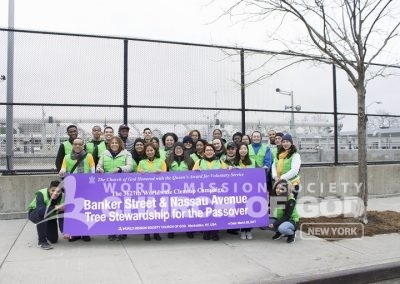 The representatives from Trees New York guided the volunteers and taught them the proper way to ensure the growth of newly planted street trees. Volunteers cleaned out tree beds to give tree roots "breathing room." Laying down mulch prevents weeds from growing among the trees. The volunteers divided into teams of four to efficiently work in unity and care for each tree. The day commenced with clearing trash and weeds from the tree beds. Next, they cultivated the soil to open the way for fresh water to reach tree roots. Lastly, volunteers laid cedar mulch in the beds to prevent new weeds from growing. The mulch also added a uniform and colorful finish. The volunteers were excited to help beautify the neighborhood and build morale throughout the community. Heavenly Mother set the example of serving others and, as a result, the Church of God volunteers were eager to give back to the community. 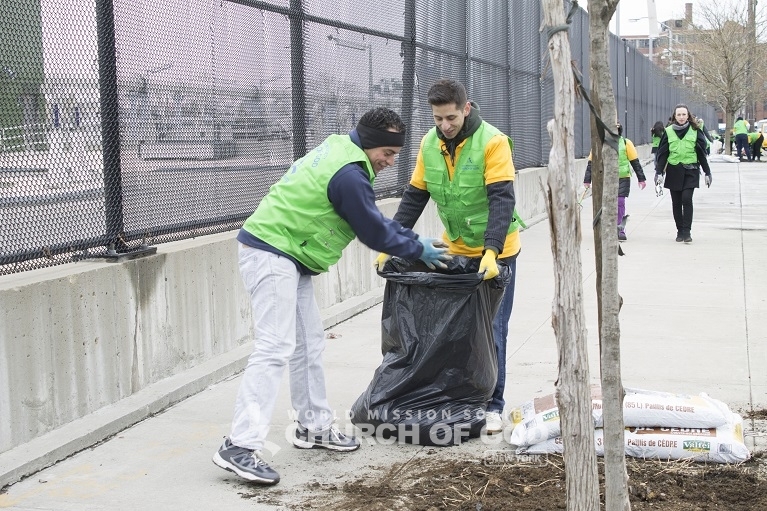 Nelson Villarrubia said that the Church of God volunteers showed a great deal of enthusiasm while working quickly to complete the goal. And the volunteers realized how much work it takes for a tree to grow healthy. If garbage and packed soil stay on top, the fragile roots of a new tree cannot receive the water and nourishment needed to develop. 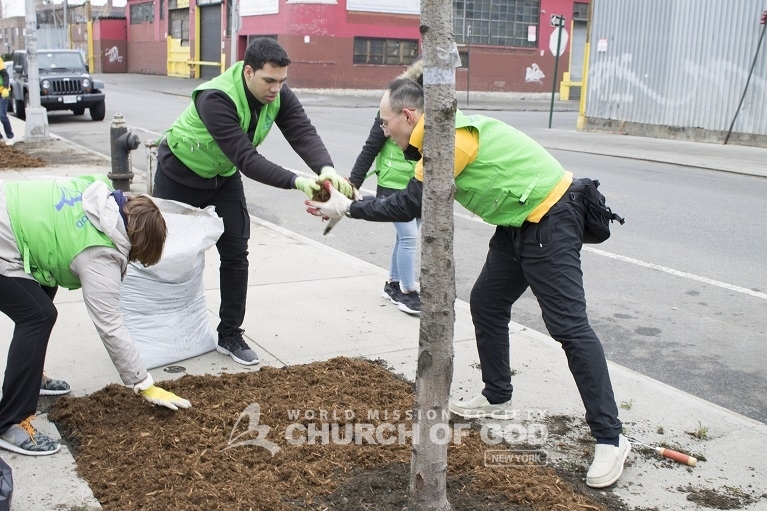 Also, if weeds remain in the soil, they will compete with the roots of the newly planted trees and prevent the trees from properly absorbing water. Volunteers joyfully acted as tree stewards to help 20 trees grow to maturity. Cultivating the soil gives more nutrients to the trees. 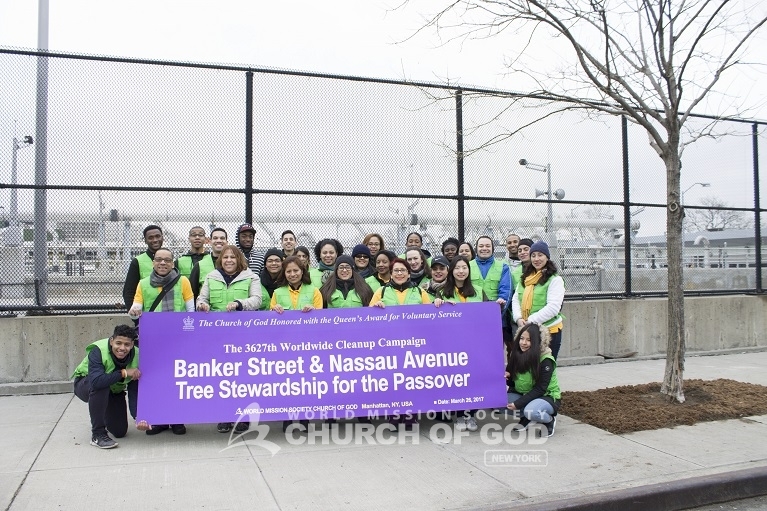 Group photo of church volunteers during the Brooklyn Tree Stewardship. When these trees reach maturity, they will purify the air 70 times more than newly planted trees. 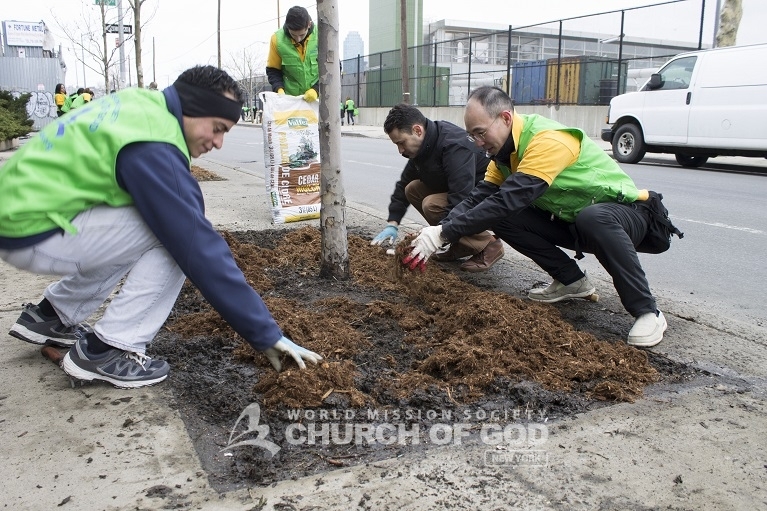 According to Trees NY, New York City trees must overcome many environmental issues, such as pollution, vandalism and de-icing agents, to mature. 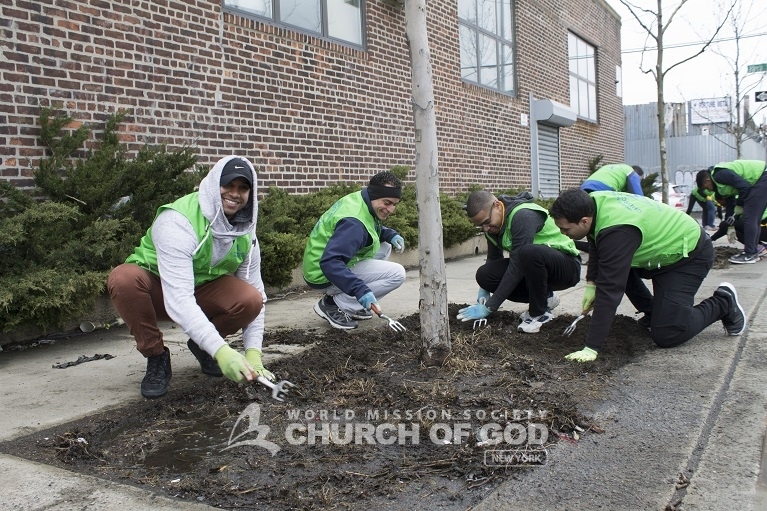 Through this volunteer activity, the Church of God played an integral role in helping to maintain healthy air for New Yorkers to breathe. WMSCOG is carrying out wonderful work of God as salt and light in the world! As a New Yorker I’m very proud to see to young people caring for our neighborhoods and ensuring a better future for all. Great job WMSCOG. We ♥️U WMSCOG in the whole world ! Animo we are one in our heavenly Mother!